A lot of people call themselves “vacation divers” and are resigned to dive only once or twice a year (or less) when they can plan a big trip. 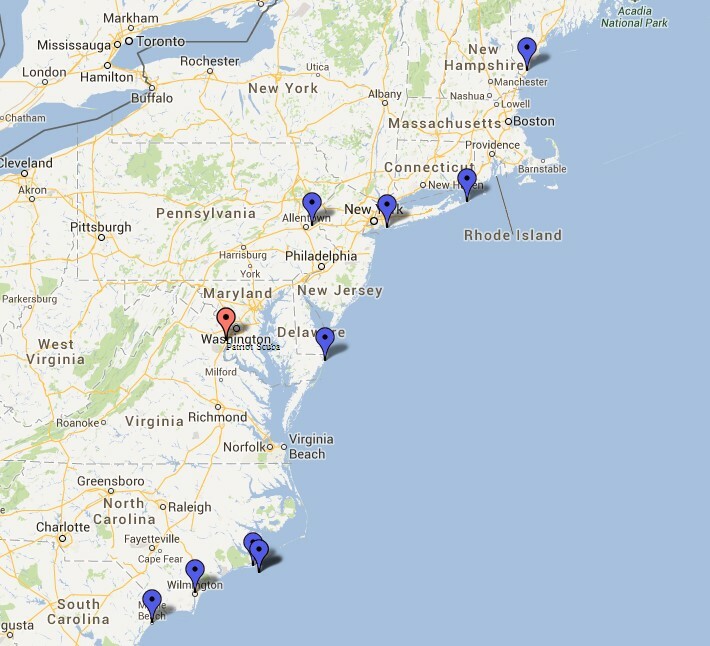 But as I was recently scrolling through a list of 50 Stellar American Dive Sites compiled by Scuba Diving magazine on their website, I couldn’t help but notice that 10 of these stellar dive sites are within a reasonable driving distance from Northern Virginia. Wait a minute…Pick a weekend, pack up the car, and take a road trip to dive somewhere new and exciting while eschewing TSA restrictions, baggage fees, and flight delays? Let’s do it! Remember that if you choose to take this kind of dive vacation, you’ll want to make sure you’re prepared. It’s not a bad idea to bring an extra tank or two. Also, a save-a-dive kit is crucial, because you won’t always have a dive professional at the ready to help you replace a broken mask strap, fin strap, or blown O-ring. Our staff is ready to help you put together a kit that can ensure you spend the day checking out wrecks or diving with fish, lobsters, and sharks instead of enduring your friends’ stories of everything you missed. Finally, now would be a good time to pick up a dive camera. You’ll need it to prove to your coworkers that you were on a scuba adventure without missing a day of work. You might also consider combining your dives with a little detour into the local attractions. These dive sites are conveniently located near some outstanding golf courses, beautiful beaches, craft breweries, Broadway shows, and self-guided lighthouse tours. Make the most of your trip by experiencing everything the area has to offer. The following list includes each site’s distance from Occoquan and approximate drive time. The descriptions are based on those offered by Scuba Diving magazine, and I’ve included a map for a quick overview of where the dive sites are located relative to Patriot Scuba.